I have decided that, in light of the BIG POWERBALL that we have right now, I am going to SHARE THE LOVE!! I bought a powerball lottery ticket and I will have 2 opportunities to win. 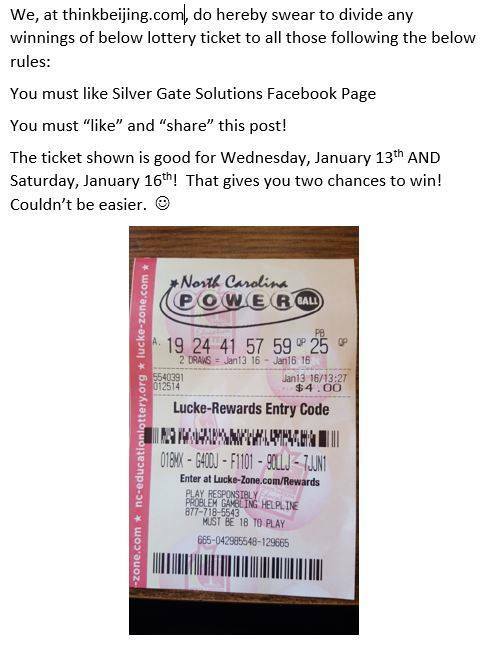 My numbers will be in the drawing for Wednesday January 13, 2016 and also on Saturday, January 16, 2016. I purchased this ticket and if I should win, I am going to SHARE THE LOVE! I am willing to split my winnings with whomever likes and shares my post on Facebook. <—- click that link there to get in the share! Is this a long shot? I believe the odds of winning are something like 1 in 252 million. Sure, you probably have more luck being born or being struck by lightning, statistically speaking, but still! It is fun to imagine. And even more fun to imagine the lives that would be changed if I did win it and was able to completely share the entire winnings of the ticket. Some may be thinking that I am absolutely nuts for even being willing to do this. And if I win, I am sure that there will be millions of people that WISH they had jumped on board this crazy train that has just pulled away from the station. But let’s think about it for a second, shall we? Let’s say I actually DO win this huge lottery. And I actually have to share it with 1,000 people that likes and shares the post. The lump sum payout that you get after taxes would be around $650 million dollars. You split that among 1,000 people, you just changed someones life with $650,000! I don’t know about you, but I know MY life would be changed with $650,000. There will be no harm if I do not win, simply because I will be no worse for the wear. I will still be doing what I am already doing and still getting results like I have continued to show you here! I thought that it would be a cool thing to do, so I am doing it. You can’t win if you don’t play, right?!?! Or better yet – take a REAL PLUNGE and schedule a one on one call with a dude that knows how to get it DONE!